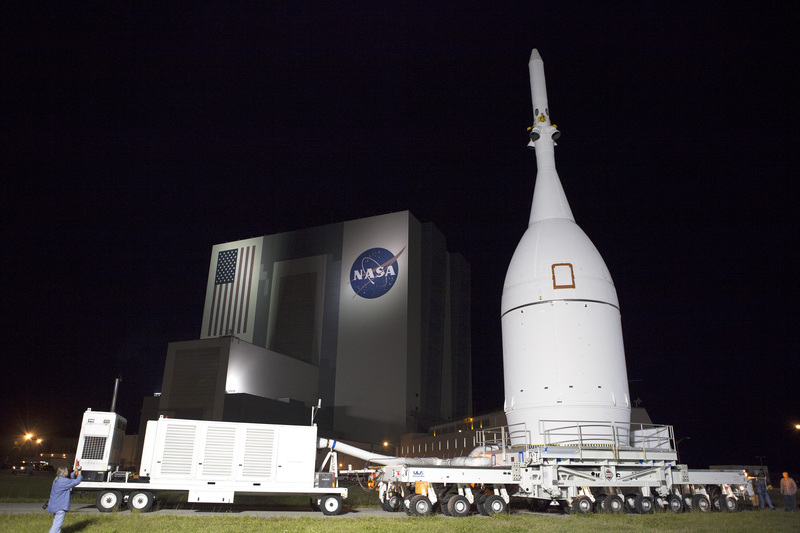 NASA officials are getting ready to launch their new spacecraft Orion atop a United Launch Alliance Delta IV Heavy rocket from Kennedy Space Center at Cape Canaveral in Florida. The mission, called Exploration Flight Test 1 (EFT-1) is set for December 4. The 73-foot-tall, 48,000-pound Orion is being built for NASA by Lockheed Martin, a Maryland-based company engaged in the research and design of advanced technology systems. The test flight will last 4.5 hour. Once launched, the spacecraft will make two orbits of Earth and one of them will send the unmanned capsule up to 3,600 miles (5,793 km) into space. By comparison, the International Space Station is circling at an average altitude of 248 miles (400 km) above Earth. Orion will reenter the atmosphere at speeds about 20,000 mph and is expected to generate temperatures up to 4,000 degrees Fahrenheit. After landing in the Pacific, the spacecraft will be recovered by the US Navy and NASA. The December flight will evaluate Orion’s systems critical to crew safety such as the electronic devices in the aircraft that control launch and high speed reentry systems, altitude control, software and heat shield performance, as well as the parachute deployment. The data gathered during the test flight is expected to reduce the potential risks and costs of a future mission, as well as to help people on the ground to make the right decisions about the design and validate the existing approaches to space systems. The United Launch Alliance Delta IV Heavy, powered by three RS 68 engines, is considered the highest capacity rocket in the world, capable to launch 50, 000 pounds of payload into space. On November 14, Orion was mated to Delta IV and over the next few weeks, the rocket and spacecraft will be integrated and tested in preparation for Exploration Flight Test 1. This is the first step on our journey to Mars, according to William Hill, deputy associate administrator for NASA’s explorations systems development. NASA officials are planning to reuse the same capsule for another test flight in the future. Exploration Mission 1 is planned to take place in November 2018 from Launch Complex 39B at Cape Canaveral and will be the second unmanned test flight of Orion, sending the spacecraft around the far side of the Moon. In 2021 Exploration Mission 2 will take a two person crew to an asteroid captured in lunar orbit or even to Mars. The future is not so distant after all.